You could never tell by listening to them, but Purity Ring were never in the same room while working on Shrines until the very end. That distance allowed them to both steer the album toward their preferred sound, and the difference in their visions is what makes the dreamy textures so disarming and so alluring. Part of the success is that Shrines transcends the dream-pop label that vocalist Megan James steers toward, being filled with Corin Reddick’s electronica and house influences. After synthesizers, the most prominent sound is sampling, particularly vocal samples, heavily skewed in pitch and tempo. Reddick has an almost minimalist-operatic understanding of repetition, cutting up his own percussion and drum beats and making them dance around James’ gorgeous images and apt metaphors. This is probably most apparent in one of the greatest songs of the year so far, Fineshrine. James beautifully juxtaposes natural imagery with bodily imagery, and, in true dream-pop fashion, focuses more on the impressions of her images, “Glide up in my sternum and hold/my little ribs around you” intriguingly following “sink into the edges round you Into the lakes across that brink/And on the edges round you.” On paper, they might not look like much, but the way they are sang, the way they can be misheard, the way James has such control over her voice that she can bring to mind a past line with her idiosyncrasies and tone is quite remarkable. She isn’t focused on telling a coherent story. Instead, she lets her airy voice create mood and relies on the same repetition with variation that Reddick does with his syncopated synth and drum pulses and a stuttered vocal line. The texture is as full as any of their genre-mates, but the production aids the mood instead of substituting for it. It invites you to look closer, and the chemistry between James and Reddick rewards you for doing so. Fineshrine aside, there are plenty of the same tricks on the rest of the songs, but the synth tracks and James’ delivery vary enough to help differentiate each track. Cartographist has a much darker tone, Ungirthed features extremely prominent use of scratching and sounds like a hip-hop vocal could rise over it just as well as the ethereality that does, and Grandloves, with the help of Young Magic, literally creates a touching dialogue against a spare beat, and lyrics gradually become enveloped in a vocoder until they, like their speakers, are lost. The songwriting throughout Shrines is enough to immerse you and create a dense atmosphere on its own. The production, from reverb to guest vocals to samples, aids that atmosphere but does not seek to create it all alone. Both James and Reddick have done their homework inside the studio and out. From a pure songwriting perspective, it’s wonderful to see a band write bridges into their songs without making them feel like an after-thought. Even better, when you compare the pop sensibilities of something like Odebear next to the staggering, dark Lofticries, it becomes apparent that these songs twist the basic pop structure into something far more diabolical; the closer, Shuck, begins not unlike the ballad Saltkin a few tracks before, but it slowly becomes something far less hopeful. The songwriting is versatile but cohesive; every song clearly has its own place on Shrines, and each one has a strong hook, at least one beat or lyric you’ll find yourself thinking over for a little bit. Choruses are good to sing to, dance with, or to let wash over you with your favorite set of headphones. If you pick the last of those options, James’ lyrics will regularly impress, even if she does tend to reuse the same tricks. James is insistent on being a poet, not just a lyricist, but her shortcomings in terms of subject matter and structure illuminate the lack of structural diversity from track to track. It’s a problem that could normally be ignored, but is harder to forgive considering the ambitions at work here. 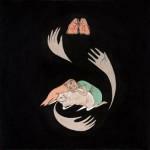 Purity Ring has crafted an album in Shrines that stands head and shoulders above the works of their peers. It may not be a high point in its genre, but at a time when there is too much repetition, too much hope that a good job in the studio can take the place of genuinely good songs, Shrines is a breath of fresh air. While not groundbreaking, Purity Ring makes a fine shrine in me, even if I don’t quite feel compelled to worship.